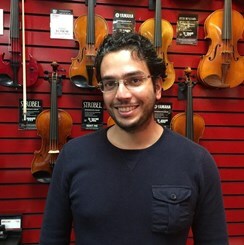 I'm a certified music teacher with over than ten years of experience working with students in both western classical, and Iranian Traditional music. I teach all levels (Beginner, Intermediate, advance), my method is Suzuki along with traditional style to establish a strong foundation in both left and right hand techniques. Suzuki is great for developing aural skills and learning to imitate, then interpret musically while traditional method makes them secure in reading and helps solidify rhythms logically (rather than 'as you hear it'. In the lessons, I try to keep a balance between having fun and learning correct techniques from the very beginning, which truly also enhances the joy in making music. No method of teaching is intrinsically better or worse than any other; it comes down to the skill of the teacher, the motivation of the student, and the chemistry between the two. With the traditional approach, music students are taught to read notes on paper from the very beginning. Reading music is an essential aspect of classical music, and traditionalists believe children should become comfortable with it as soon as possible. The theory behind Suzuki is that you learn music the same way that you learn to speak, through immersion. Children who learn to read early learn to read because their parents read to them, right? The same principal is applied. The important factors in Suzuki are listening, performing, and parental involvement. Request Lessons with Sam Aazami today!